The Ur-Quan Masters is an open-source version of the old game Star Control 2. Even by modern standards, this game is pretty impressive, sporting an immersive, compelling storyline, and a vast world to explore. I wrote a Perl script to read in some data files for UQM, and output a vectorized PDF map, so that I could scale it to any size. After recolorizing it to be printable and fitting it onto a single 8.5x11" sheet of paper, I discovered that it's not very easy to read at that size, but it still makes a good quick reference. 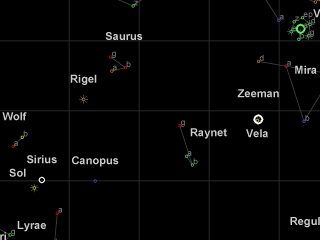 Update: Alan De Smet has taken the source and made some improvements to the map, such as adding spheres of influences, basic layout changes, and fixing the constellations. Additionally, his maps are available as white-on-black and black-on-white, as well as spoiler-free and spoiler-filled.